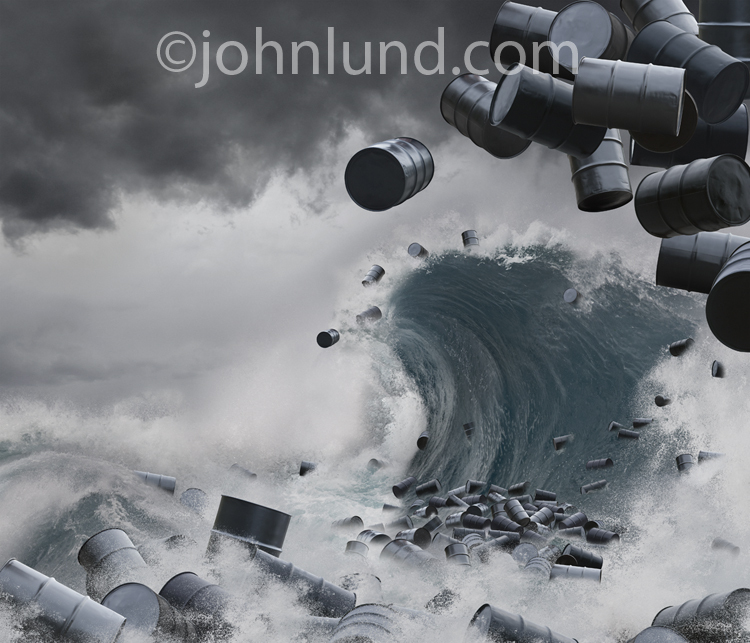 An ocean photo, a sky pictures, and a barrel photograph become a sea of toxic waste or oil spills in this stock photo. This version of all barrels and sky is what I originally envisioned as an environmental stock photo to illustrate concepts of pollution and toxic waste. After the Deep Water Horizon Gulf oil spill I thought it might be a good idea to create a stock image that could be used to illustrate and bring attention to the environmental issues of offshore oil production and drilling, as well as those of transportation of crude oil. 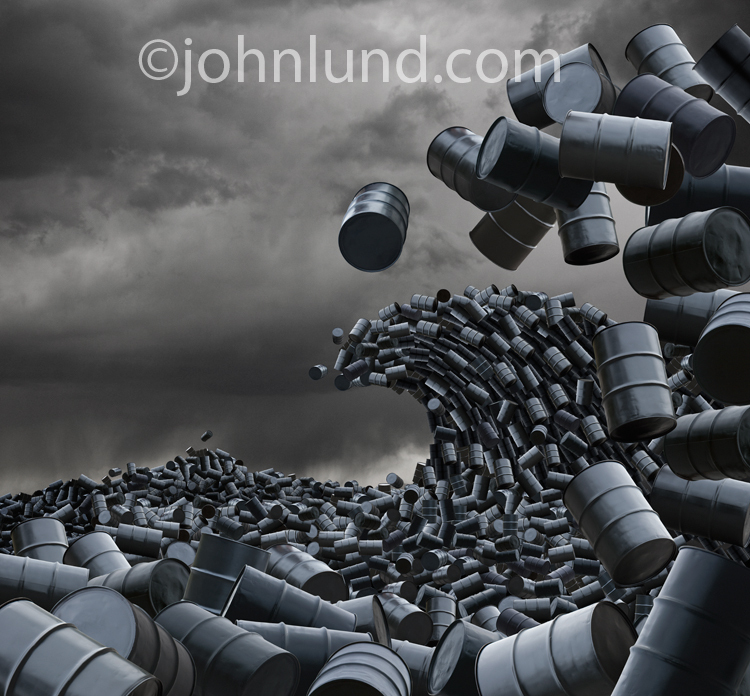 But how do you photographically illustrate an oil spill in a concept stock photo? I thought of the rainbow colored sheen one often sees on the street after a rain, but couldn’t quite figure out how I could make that work. A foundering ship perhaps? A burning offshore oil rig? 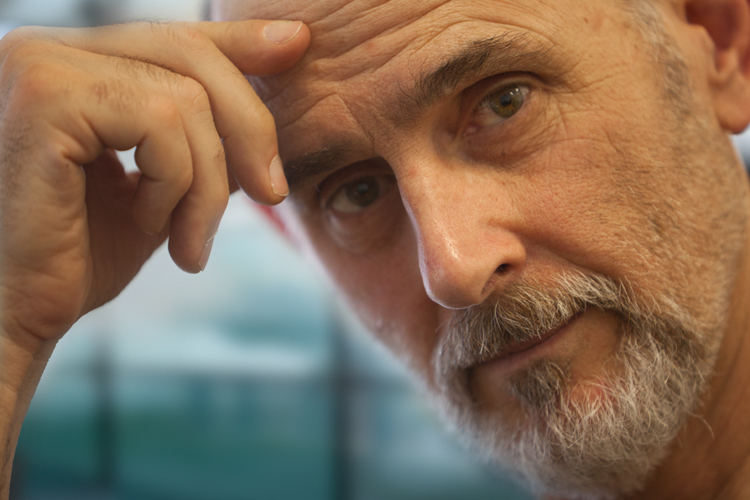 I let the idea percolate thinking that an answer would come eventually, and it did. Months later I was listening to the radio when the newscaster was talking about how many barrels of oil had spilled. That was it…barrels! I could fill the ocean with oil barrels. Heck, I could make a tidal wave or tsunami of oil barrels! Such an image, I imagined would be very simple to execute. All I would need is one black 55-gallon drum. I could photograph the barrel and then use Photoshop to, one by one, build up a sea of oil barrels. I checked Craig’s list, found a drum, and paid $25.00 for my one prop. I waited until I had an overcast day, and then photographed the drum in a variety of positions in the parking lot in front of my studio. Before I photographed the drum I spray-painted it with flat black paint. I photographed it outdoors because I know from experience if I tried to shoot it in my studio it would have reflected everything in there. In the parking lot, on an overcast day, the only reflection I would have to worry about would be that of whoever helped hold the barrel in the various positions I would need. As it turned out even those reflections didn’t turn out to be a problem. To create the image I used Bridge to select the barrel shots I felt I would need, and then used Photoshop’s pen tool to create a clipping path around each 55-gallon drum. Next, I opened a file I had created a while back of a tsunami. My plan was to use the tsunami image as a template for this new image. It was a simple, straightforward task to open the barrel images and paste them in position using the tsunami image as a guide. After about half a day of inserting barrels, rotating them, sizing them and positioning them, I was only about a quarter of the way done…. if that. It quickly dawned on me that perhaps an entire sea of oil barrels might not be the only image to come out of this effort. I liked the look of the barrels floating in the water. I started adding layer masks to the barrels and then blending the barrels into the water. Once I had the basic look I wanted I went to my archive of ocean imagery and selected splashes of spray to position over and among the barrels. That added a sense of action and helped deal with difficult transition areas between barrel and water. Here and there I added an adjustment layer of brightness and contrast…and some spot cloning clean up as well. Finally, I brought in elements of water and sky to transform the base ocean image that I had brought in as a template to a new look so as to eliminate any problem of similars. At that point I had my first image, oil barrels tossing in the surf of an ocean storm. I then spent another day adding in more barrels until no ocean was left visible, thus coming up with the second image that was what I had originally envisioned: A sea of barrels, glistening and black, ominous and filled with anything from oil to toxic chemicals to radioactive waste. Hopefully this is a stock photo that can be used to bring attention to pressing environmental challenges and perhaps help make a difference in the survival of our planet. It's good graphic design work but calling it "a photograph" is a bit wide of the mark, isn't it? If it takes two full days to generate a single stock image, you're only going to generate about 125 images a year, working full time. I like the first one much better. I don't think the lighting/shadows on the barrels works as well in the second. The water hides it in the first and is much more dramatic anyways. Good luck with them. Answer, Hell Yes. Stock photography is all about offering strong, creative images, most of the advertising shots, especially car shots you see in magazines are all composite images, or a mixture of composite and CGI. I wish I had the time to devote to producing stock images. I am a full time stock shooter and I create somewhere around 200 images year. Why wouldn't that be stock photography? Yeah, I see your point, but I still like them both! The first one is absolutely AWESOME.